Enter by 11:59 pm EST on Thursday, June 1st for your chance to win. 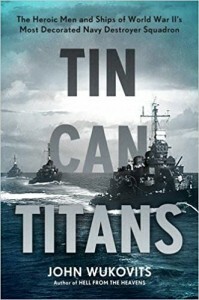 John Wukovits’ Tin Can Titans: The Heroic Men and Ships of World War II’s Most Decorated Navy Destroyer Squadron tells the story of Destroyer Squadron 21, which sunk (or helped sink) 10 submarines and a number of other surface vessels, destroyed an abundance of enemy planes, and rescued more than 1800 serviceman. Wukovits, a military historian, interviewed the squadron’s survivors and sought out diaries and letters from those who served to tell a full, compelling portrait of the most honored squadron of WWII. We’re giving away a copy of this book to one lucky reader. Enter by 11:59 pm EST on Thursday, June 1st for your chance to win.